He loves the blues and golf, she loves the joys of feeding and entertaining family, and they can enjoy it all on a daily basis, in this supremely comfortable home overlooking the links. 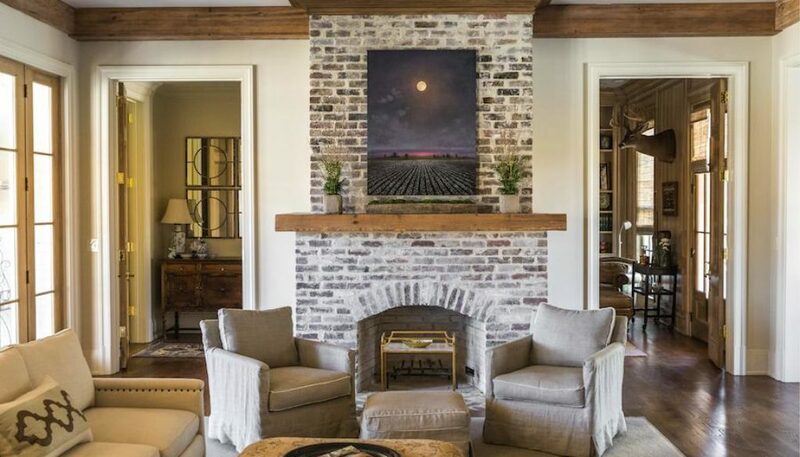 Julie and Robert Agostinelli had individual, but compatible, wish lists when they decided to build their dream house at the Clarksdale Country Club. And thanks to the talent and vision of popular Delta residential designer Frank Tindall, everyone is more than happy with the result: an expansive, classic family home on Westover Drive, overlooking the golf course. Julie’s great love is cooking, and with four grown children and now the addition of a young in-law, she has done quite a lot of it. 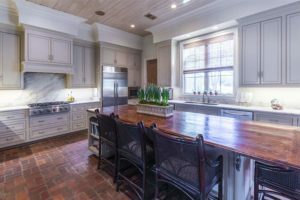 She requested a big, open kitchen and an adjoining living area, where family and friends can gather, hang out, and share stories while she whips up her specialties. Their kids, Matthew, Grace Ann, Michael, and Lauren, who range in age from twenty-six to eighteen, visit often from their own homes, or college (in the case of the two younger ones, who are at Ole Miss and Mississippi State). The kids may be grown, but they are hardly gone: they come home often, for events like the Juke Joint Festival, or the Sunflower River Blues Festival. While they knew just what they had in mind, they had a bit of trouble finding it. “We looked through hundreds of house plans,” recalls Julie, “but we just didn’t see exactly what we wanted. We have always loved the houses Frank Tindall designed, so we called him. We told him we wanted something homey and livable.” He certainly delivered, creating private spaces that fit everyone’s separate needs, while providing more than ample venues for the times when everyone comes together. Working without an interior designer per se, the Agostinellis allowed Tindall the creative pleasure of making the decisions on everything from fixtures, countertops, paint colors, to flooring. He specified lots of natural materials, from old brick to stained woods, and used a pleasingly neutral, warm palette for the walls. Just as Julie doesn’t hesitate to name the large, open, light-filled kitchen as her favorite room, Robert is quick to claim his study as his go-to refuge when there isn’t a golf tournament, televised ball game, or agricultural demand to distract him. The cypress-paneled room is filled with the things he treasures most: artwork by his daughter Grace Ann, and Indian artifacts he has collected. 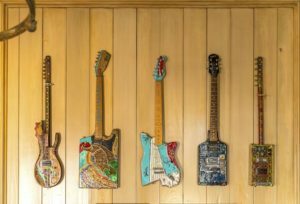 But his eyes light up especially when he shows off his prize collection of hand-built, folk art guitars by blues legend Super Chikan. “We have become great friends,” enthuses Robert. “He played at our daughter’s rehearsal dinner. Maybe once a month or so, I’ll go over to his place, and in a shed behind his house, we play. He’s teaching me the blues.” Successfully? “Well, my wife says I’m getting a lot better,” he laughs and so does Julie, but in a nice supportive way, of course! Only two of the Agostinelli offspring were still living at home when the house was completed in 2014, and they were old enough to be looking towards leaving the nest after graduation. So Tindall designed a large upper story with three large bedrooms, plus a den and exercise room, that could be easily closed off when only Julie and Robert remained. Their spacious master suite is downstairs, accessible via a hallway off the study, complete with a large, luxurious spa bathroom. Usually, when a couple is telling the story of building such a large, detail-filled house, they recall a few hiccups or setbacks. Not so in this case; they have nothing but praise for their builder, Brian Atwood of Atwood Construction. And Julie enjoyed working with her sister, Mary Helen Hepner, to select the furnishings and accessories. “Our intention was to use a lot of what we already had, in our former house,” says Julie, “but we ended up finding lots of new items that really work in the rooms.” They found several things locally, and in Memphis, as well as Frank Tindall’s antique sources in Atlanta. Tindall also designed the home’s cabinetry, which was made and installed by Wilbourn and Son.